Nature Materials, 2017, 16:1252-1261.. ZSTK474 purchased from Selleck. C. MCF-7 cells were transfected for 5 h with a plasmid containing GFP/mRFP-tagged LC3 (tfLC3) reporter gene by use of lipofectamine 2000, then treated with 2 μM of ZSTK for 0, 3, 6, 17, and 24 h, respectively. The treated cells were fixed to be available for microscopy. The GFP/mRFP images were acquired using Olympus FV1000 laser scanning confocal microscope. Arrows indicate autophagosomes. ZSTK: ZSTK474. Rapa: rapamycin. Oncotarget, 2016, 7(15):19897-909. ZSTK474 purchased from Selleck. J Cell Physiol, 2018, 233(3):1796-1811. ZSTK474 purchased from Selleck. Representative Western blot of Erk1/2, phospho-Erk1/2, Akt, phospho-Akt antibodies in BCPAP, K1 and 8505C cells treated at 4 h using IC50 doses. 1, cells untreated; 2, cells treated with RAF265; 3, cells treated with ZSTK474; 4, cells treated with SB590885; 5, cells treated with RAF265+ZSTK474; 6, cells treated with SB590885+ZSTK474. Invest New Drugs 2014 32(4), 626-35. ZSTK474 purchased from Selleck. 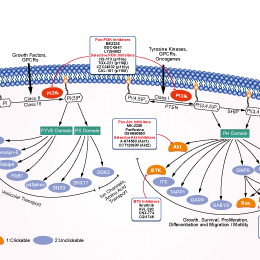 Effects of Velcade and ZSTK474 on expression of proteins central to the PI3K/Akt pathway in GBM cell lines. U87 and U118 were cultured for 24 h with Velcade (100 nM), ZSTK474 (2.5 uM), or both simultaneously. Lysates were made and subjected to western blot analysis for P-Akt, P-mTOR, P-4EBP1 and cyclin D1 as well as GAPDH loading control. Int J Oncol 2014 44(2), 557-62. ZSTK474 purchased from Selleck. The proliferation of tachyzoites in ARPE-19 cells was examined by fluorescence microscopy. Cells were pre-incubated with PI3K inhibitors, 250 nM GDC-0941 and 10 nM ZSTK474 for 1 h. After washing, the cells were then infected with T. gondii at moi of 5 for 24 h. Cells were fixed and stained with Texas Red?X phalloidin for labeling F-actin (red), and nuclei were stained with DAPI (blue). Data are representative of three independent experiments. Scale bar = 100 uM. PLoS One 2013 8(6), e66306. ZSTK474 purchased from Selleck. Saraswati Sukumar of Johns Hopkins University School of Medicine. ZSTK474 purchased from Selleck. Western blot analysis of Akt and p-Akt. 0-20μM ZSTK474 was added. Dr. Zhang of Tianjin Medical University . ZSTK474 purchased from Selleck. First orally administered PI3K inhibitor used in vivo. A549 cells are lysed in a buffer containing 20 mM Tris-HCl (pH 7.5), 150 mM NaCl, 5 mM EDTA, and 1% Igepal CA-630, the lysates are centrifuged at 20,000 g and 4 °C for 10 minutes, and the supernatants are used as cell lysate (protein = 2-4 mg/mL). To immunoprecipitate PI3K, 200 μL of cell lysate are incubated with anti-p85 polyclonal antibody and protein G-agarose (5 μL). PI3Kα, PI3Kβ, and PI3Kδ can be immunoprecipitated by the anti-p85 polyclonal antibody. Agarose beads containing immunoprecipitates are washed twice with buffer A (20 mM Tris-HCl at pH 7.5, 150 mM NaCl, 5 mM EDTA, and 1% Igepal CA-630), once with buffer B (500 mM LiCl and 100 mM Tris-HCl at pH 7.5), once with distilled water, and once with buffer C (100 mM NaCl and 20 mM Tris-HCl at pH 7.5). Immunoprecipitates are suspended in 20 μL of buffer C containing phosphatidylinositol of 200 μg/mL. The mixture is preincubated with increasing concentrations of ZSTK474 at 25 °C for 5 minutes. [γ-32P]ATP (2 μCi per assay mixture; final concentration, 20 μM) and MgCl2 (final concentration, 20 mM) are added to start the reaction. The reaction mixture is incubated at 25 °C for 20 minutes. Phosphorylated products of phosphatidylinositol are separated by thin-layer chromatography and visualized by autoradiography. The phosphatidylinositol-3-phosphate region is scraped from the plate, and radioactivity is also measured with liquid scintillation spectroscopy. The level of inhibition for ZSTK474 is determined as the percentage of 32P counts per minute obtained without ZSTK474. Cell lines: MCF-7, HT-29, HCT-116, OVCAR3, A549, et al. Method: Cells are exposed to increasing concentrations of ZSTK474 for 48 hours. The inhibition of cell proliferation is assessed by measuring changes in total cellular protein by use of a sulforhodamine B assay. Apoptosis is assessed by chromatin condensation or by flow cytometry. For chromatin condensation assay, cells are stained with Hoechst 33342 and examined by fluorescence microscopy. Morphologic changes induced by ZSTK474, such as the condensation of chromatin, are indicative of apoptosis. For flow cytometry analysis, cells are harvested, washed with ice-cold PBS, and fixed in 70% ethanol. Cells are then washed twice with ice-cold PBS again, treated with RNase A (500 μg/mL) at 37 °C for 1 hour, and stained with propidium iodide (25 μg/mL). The DNA content of the cells is analyzed with a flow cytometer. Yaguchi S, et al. J Natl Cancer Inst, 2006, 98(8), 545-556. Kong D, et al. Cancer Sci, 2007, 98(10), 1638-1642. Kong D, et al. Eur J Cancer, 2009, 45(5), 857-865. Marone R, et al. Mol Cancer Res, 2009, 7(4), 601-613. Yang S, et al. PLoS One, 2011, 6(10), e26343. Haruta K, et al. Inflamm Res, 2012, 61(6), 551-562.